Signs4Success is a full-service sign design and production shop located in Eden Prairie, Minnesota, that services clients in the Twin Cities, outstate Minnesota, and nationwide. We are proud to be a Service-Disabled Veteran-Owned Small Business, and commitment to service is one of our hallmarks. Signs4Success provides sign solutions for all your signage needs: real-estate signs, yard signs, monument signs, channel-letter signs, window graphics, vehicle wraps, directional signs. You name it, we either do it ourselves or work with trusted partners. At Signs4Success, we work with each customer to provide one-of-a-kind solutions catered to their business needs and budget. Where other sign shops may cut corners on materials or by hiring employees fresh out of school, Signs4Success's experienced professionals work with you to produce the best design using appropriate materials to fit your need and your budget. Our signage experts allow businesses to spend spend more time focusing on their customers and less time learning about sign options, design strategies, materials, permits, and other time-consuming tasks associated with signage. Signs4Success believes in building and maintaining relationships with its customers through unmatched customer service and guaranteed quality. This means getting you fit-for-your-purpose sign solutions. It's about taking the time to learn what clients really need their signage to accomplish and then providing expert advice on how to get there. 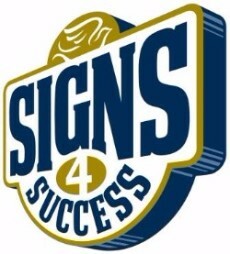 As the name implies, Signs4Success is all about YOUR success.